Horse owners and ranchers understand the value of having a quality, well-designed barn to house animals. A good barn not only houses animals, but also is aesthetically pleasing and improves the value of the property. A well-designed barn also makes it possible to house multiple animals in one location. That’s why aisle barns offer several advantages when compared to other types of barn structures. Airflow and ventilation are important in any barn, as dust and odors can quickly become a problem in barns that don’t have adequate airflow. Plus, a poorly ventilated barn can become dangerous during warm weather as the temperatures inside increase rapidly. The open center in an aisle barn is conducive to good airflow, and opening the doors on both ends of the barn can quickly air out the entire structure and allow a breeze to pass through. The expansive design of an aisle barn makes it easy to house multiple animals all under one roof. Housing animals in one central location is convenient, but also makes it easier to keep an eye on them. Multiple stalls of ample size and a spacious center aisle that is 10 to 12 feet wide makes it easy and safe to work in the barn, as well. You can also add a tack room or supply area off the aisle to add even more convenience and improve the efficiency of your day-to-day operations by providing storage right where the animals are housed. Aisle barns can also be designed with Dutch doors in the back of each stall. 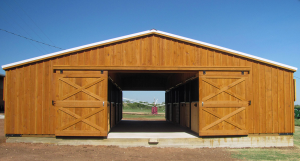 These doors can provide quick access for your horses to get to an adjacent fenced in area to exercise and makes getting your animals in and out of the stall safe and easy. Animals can be brought into and out of the stall from either the outside or the center aisle, making it much easier to let your horses come and go as they please. At Deer Creek Structures, we offer a selection of aisle barns with different configuration options to allow you to make your barn as convenient for you and your operation as possible. As a family-owned business that has been providing high-quality barns and ranch structures since 2005, you can trust in our high quality of workmanship and our affordable prices. 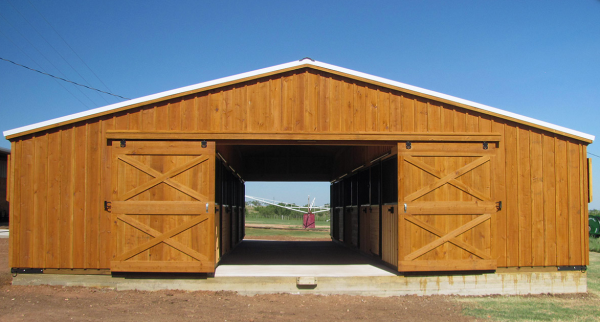 To learn more about our aisle barns and other structures to help you and your operations, give us a call today at 254-546-2276.